“With a love for the environment that took root on his family’s farm, senior Jesse Hinricher aims to put less expensive components into more efficient batteries. Energy production can be expensive, or inefficient, or toxic to the environment — or some unfortunate combination of the three. But Jesse Hinricher thinks it doesn’t have to be. Hinricher, an MIT senior majoring in chemical engineering, has been conducting research focused on specialized batteries that could be plugged into the grid to provide renewable energy on demand. Specifically, he works on swapping out some of the pricier electrolytes in so-called redox flow batteries for more abundant ones, which could help make clean energy more affordable. He cites his rural childhood as the initial source of his passion for environmental conservation. Hinricher grew up on a Minnesota farm, planting and harvesting soybeans, gardening, and tending cattle on his mother’s farm. His mom, who singlehandedly tends the 700-acre family farm, instilled in him the importance of hard work and independence, which remain some of his core values. “She taught me to value education, and knowledge, and her work ethic has been a source of inspiration to me,” he says. On a farm, he says, everything is mechanical; he enjoyed working with his hands. That affinity, blended with his drive to develop solutions for climate change, led Hinricher to study chemical engineering. He had seen firsthand how dramatically the seasons changed over years. For him, climate change wasn’t a distant concept; it was an increasingly alarming reality, and one that he felt he couldn’t ignore. Since January 2017, Hinricher has worked in the lab of Fikile Brushett, the Cecil and Ida Green Career Development Associate Professor in the Department of Chemical Engineering, on developing redox flow batteries. In some ways, these are similar to batteries you might put in your TV remote: Electrolytes ferry electrons between a cathode and an anode, producing energy. However, the energy density of redox flow batteries is too small to be used for something like a remote, or even a cell phone. They’d likely be incorporated into large-scale energy grids, and would theoretically be more energy efficient and less geographically dependent than other renewable energy storage devices. For example, in the middle of the day, solar panels are producing lots of energy, but after the sun sets, they are not. Redox flow batteries can store renewable energy for people to use all day rather than relying on coal or natural gas plants. The pitfall of these batteries currently is that they require rare and expensive materials. That’s where Hinricher’s work comes in; his research focuses on identifying less expensive electrolytes and troubleshooting any flaws in their implementation. “If we can discover less expensive materials, it makes redox flow batteries more commercially attractive, which would be the coolest thing to ever have contributed to,” he says. Though Hinricher enjoys his work at MIT, it isn’t where he began his collegiate career. After graduating high school in 2012, he enrolled at the South Dakota School of Mines and Technology. He says that the School of Mines is well-connected, and does an excellent job of preparing its students to enter into industry. However, as much as he liked the applied side of chemical engineering, he was deeply interested in the theoretical aspects as well. He eventually transferred to MIT in fall 2016, excited to delve deeper into the conceptual side. Hinricher also took a semester off his studies at Mines to serve as a Lunar Advanced Volatile Analysis subsystem integration and testing intern at NASA. There, he worked on the Resource Prospector Mission, developing analytical instruments for a robot intended to one day go to the moon and search for water. Then, through a student research program held at Princeton University, he researched polymers that could stitch themselves back together when damaged. 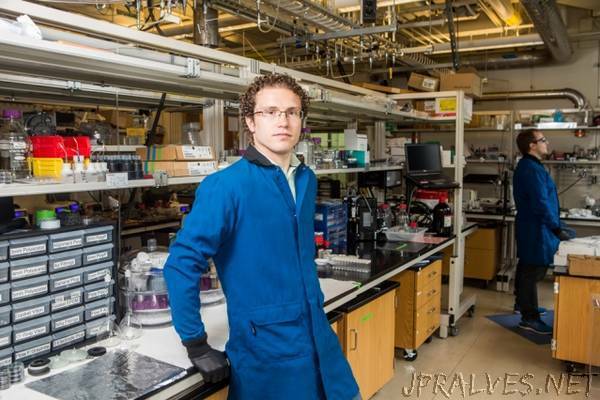 At the time he received his acceptance to MIT in 2015, he had ventured out to Berkeley, California, for an internship at the solar technology startup PLANT PV. Hinricher credits the startup’s co-founders, Brian Hardin and Craig Peters, as major influences on his career and mentorship. “They made me an offer to stay out in California for a year and defer admission here, and I accepted, and had one of the best experiences that I could have asked for,” he says, describing how he saw firsthand to manage a startup and conduct cutting-edge research on renewable energy sources. His experiences also inspired him to dream of starting his own company one day. Outside of classes, Hinricher likes to stay in touch with the nature that inspired his conservationist outlook in the first place. When he worked for PLANT PV in California, that meant winding through the towering trees of Muir Woods. Now, it’s anything from the White Mountains in New Hampshire to the Arnold Arboretum of Harvard University. He’s also a member of Trash2Treasure, an MIT recycling program that places donation sites for used items in campus dormitories each spring. Then, in the beginning of the next academic year, T2T sells it back to the student body at a serious discount. One year, the organization managed to save around 250 boxes of items, which is something like 33 tons of material. “It saves material that would have gone to landfill, and allows students to buy last-minute items very inexpensively,” he says. Anything that the group doesn’t sell is donated to a charitable organization.